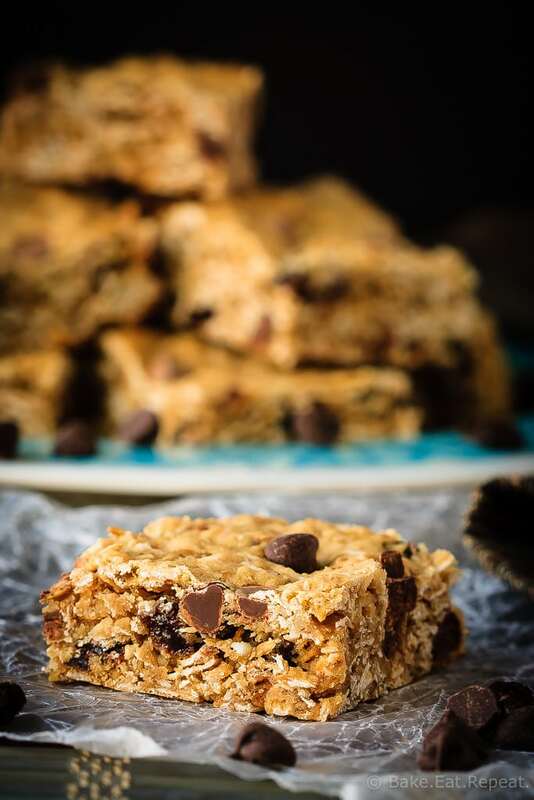 These chewy oatmeal raisin chocolate chip bars are so easy to make and everyone will love them. Your favourite cookie in bar form! Oatmeal raisin chocolate chip bars today, because the only thing better then an oatmeal raisin chocolate chip cookie, is a bar cookie. All the cookie deliciousness without the extra time spent making individual cookies. Bar cookies are just so easy. Mix up the dough, throw it in a baking dish and you’re done. No chilling, no forming individual cookies, no baking one tray at a time. Just cookies – really, really fast. The only difficulty is waiting for them to cool before digging in. They don’t cut very nicely if you don’t wait. Although I wouldn’t know anything about that. I’m the picture of patience when warm chocolate chip cookies of any kind come out of the oven. Definitely, that sounds like me. If you can’t wait for them to cool off though, they’ll still taste just fantastic. Maybe even better, since straight out the oven cookies are always amazing, but they definitely won’t cut into pretty little bars. 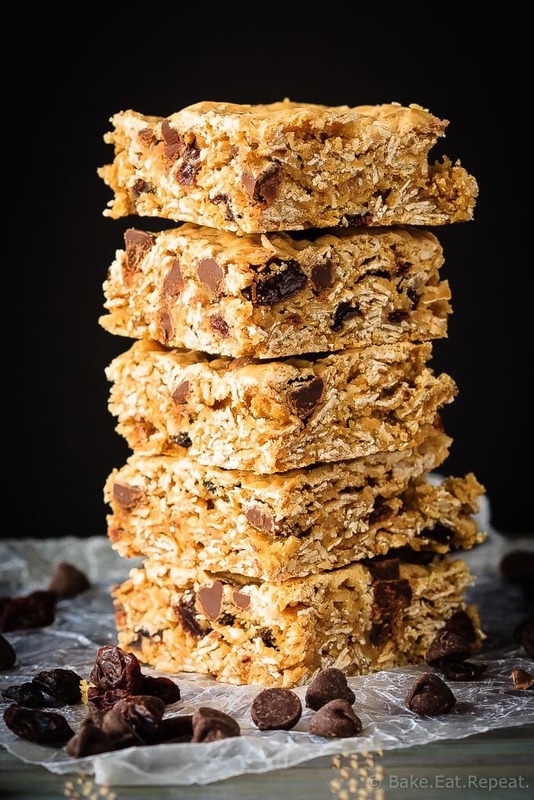 These oatmeal raisin chocolate chip bars are chewy and hearty and filled with oats, raisins, coconut and chocolate chips. They make the perfect snack – a cookie that is also hearty and filling. Plus they’re very adaptable, and easy to change to your personal preferences. If you don’t like raisins, or coconut, just use chocolate chips. If you don’t like chocolate chips, then I can’t help you. That’s just crazy talk. 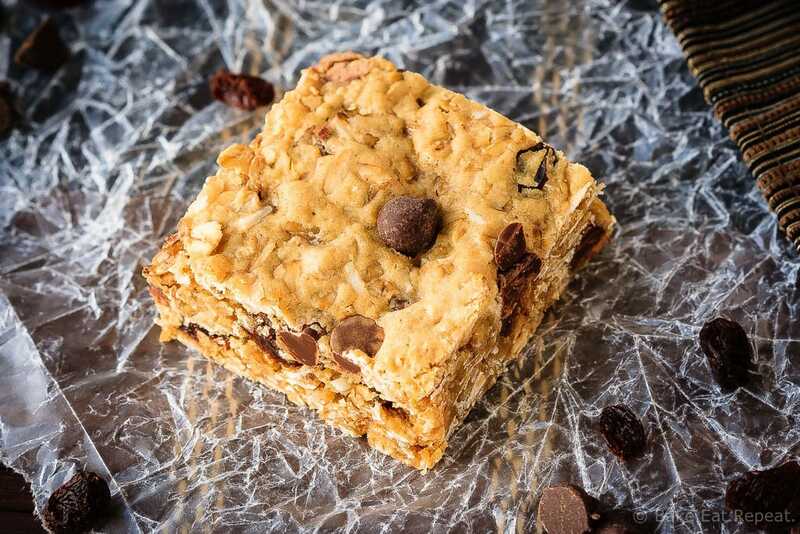 However you make them though, these oatmeal raisin chocolate chip bars are fantastic! Line a 9x13 inch baking dish with aluminum foil or parchment paper and spray lightly with cooking spray. In a large bowl, whisk together the coconut oil, brown sugar, eggs, milk and vanilla until smooth. Add the salt, baking soda, flour and oats and mix until just combined. Stir in the coconut, chocolate chips and raisins. Dump the mixture into the prepared pan and press down firmly. Bake for 20-23 minutes until just set and lightly browned on top. Allow to cool completely before lifting out of the pan and cutting into bars. Store in an airtight container, they keep well for 1 week. Source: Adapted from Cookies and Cups .